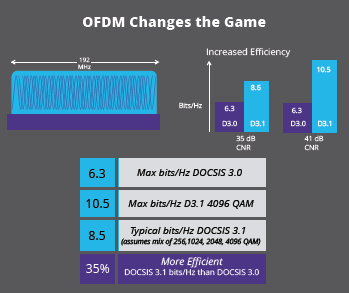 DOCSIS 3.1 includes new technologies and its implementation can be complex, so preparing the network and monitoring its performance is critical. Read on for a few tips on making the rollout as smooth as possible. 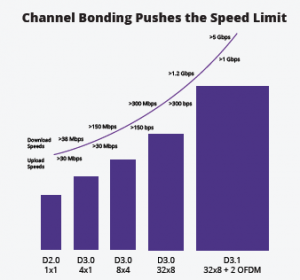 DOCSIS 3.1 adds support for bonding 32 QAM carriers plus 2 OFDM carriers on the downstream, and 8 QAM carriers plus 2 OFDM carriers on the upstream. Proper bonding needs to be verified to assure customers receive their expected service level by performing a DOCSIS 3.1 range and registration test. Proper bonding of DOCSIS 3.0 and 3.1 carriers also must be verified. Orthogonal frequency domain multiplexing (OFDM) departs from having a single QAM carrier in 6 MHz to using 4k or 8k overlapping subcarriers across 24-192 MHz. OFDM provides more bits/Hz at the same signal-to-noise operating conditions. The added complexity provides additional efficiency and noise immunity to the cable system. For more information on how to manage a successful DOCSIS 3.1 deployment, download this in-depth infographic today or visit our DOCSIS 3.1 resources page.